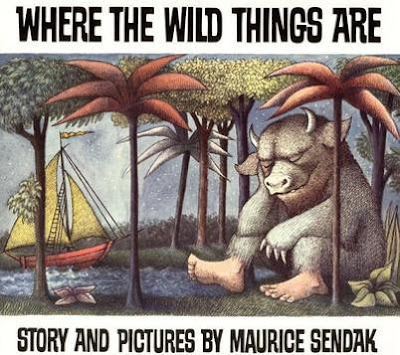 Maurice Sendak's book was written in 1963 (can you believe that?). I've read it to every classroom when I taught, and it is one of my five year old's favorite books! I was thrilled to hear Spike Jonze was directing the movie version, and I'm curious what Dave Eggers has done to the screen play, since there are so many parts of the story to be filled in. 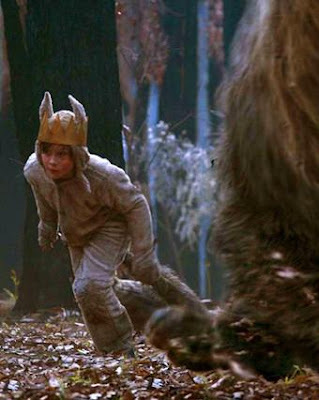 In the book, the boy goes where the wild things are, in a type of dream sequence. But in the movie, he goes to a real place, which may take away some of the innocence of the story. Because of the place being real, I hear Max's room never changes to a jungle, which is probably my son's favorite page in the book. Still, we are both dying to see it! Ooh I cant' wait! I loved this book when I was a child and can't wait to read my daughter when she's older! I'm so excited to see this movie! I'm thinking I'll make a special day of it and take my son to see it. for some reason, I just never liked this book. i'm not sure why. I'm ready for it too, but apprehensive about liking it since I love the book so and am nervous about the movie influncing all of the kids in the future who may see it before reading the classic story! i loved this story as a child and i am very excited to see this movie. i can't believe they made a 10 page children's book into a movie. i can't wait to see it. doesn't it look AMAZING?!?! we just bought this book for the kids and i'm so beyond excited to see this movie! this looks SO cute! Our son is too little for it now...but someday!